Frantic Mama: Since When is Being Shy so Terrible? This is probably something you have only noticed if you have a reserved, shy, and/or introverted child. Or if that's how you define your own personality. Having a child that fits this personality type, I've observed a general consensus that being shy or reserved is something to "work" on. Apparently, it's not as good as being outgoing and extroverted. But why is being reserved, watchful-- or even shy-- so negative? I have frequently found that 'watchers' (we'll call them) are more observant, more sensitive to others, and really, to be totally honest, often smarter than those of us who just recklessly dive right into something. I'm a bit of an odd mix, I suppose. I like to chalk it up to being a Gemini (the twin Zodiac sign): I'm outgoing and not at all shy, but I'm also textbook introverted-- spending time being social in a big group is exhausting to me. I've read that extroverts become energized by being with others. That's certainly not me. Like husband and me, my 3 year old son falls into the introverted category. He seems to prefer smaller groups. Big groups and crowds completely overwhelm him. However, different from me but similar to my husband, my son also falls into the reserved, watchful category. He might wave to a passerby, but he certainly doesn't jump into the center of a group to command attention. In fact, he cried when all of us surrounded him and sang happy birthday on his 3rd birthday. (Not my kid, but it could be; Image from ConsumerBell). I'm fine with this. That is, I've learned to be fine with this. Because I admit this personality type can be challenging to parent. (Just try explaining why your kid cries when people are celebrating his birthday or runs into another room when friends come over. It can be embarrassing.). He also doesn't like having people over, which is tough on me (even I would like some adult contact during the day!). He is usually quiet at preschool and in groups, so I don't think teachers know how much is going on in his busy little brain. He certainly doesn't have a large social circle (then again, do any 3 year olds?). Fortunately, I've come to appreciate that there are many positives about this temperament, some of which outweigh the challenges. Isn't there something most charming about a shy smile? Isn't the more reserved person often the most thoughtful and least aggressive? They aren't busy talking; they're busy listening. 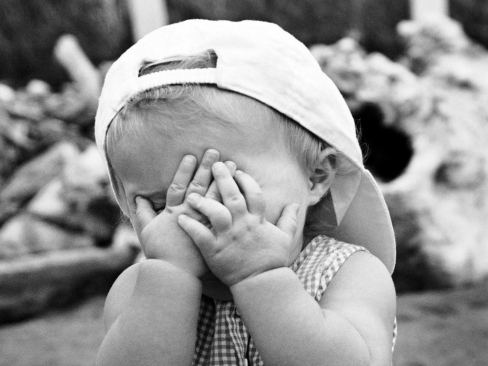 When he says something really smart, he covers up his eyes with his hands to hide from praise; it's painfully adorable. There is something inexplicably humble about the shy person. They don't feel the need or desire to be the center of attention. Perhaps that's why I married a watcher. And why I'm learning to embrace a watching child as well. Here's what I'd like to propose for any interested parties: let's not see shyness/introversion/reticence as so innately negative. Please stop looking at me with pity if my son hides a bit behind my coat when entering a new situation. Please stop trying to make him be the center of attention. Please stop sighing when you tell me "he didn't really play with the other kids" at school that day or that he wasn't the first to jump in the baby pool. He may not be easy-peasy, but he's just fine. Really. I love him just the way he is. *I have recently read Elaine Aron's book, The Highly Sensitive Child. Whoa! My son absolutely fits her description of a Highly Sensitive temperament. If some of the above sounds familiar, you can read more of my thoughts on Aron's book here. *I'm honored this piece was featured on Mamapedia. Check it out here! *If you have a second, please click the Top Mommy Blogs button on my blog!